Q: How big is your kitchen? A: Tiny, as the picture above shows. If you measure wall to wall, it’s about 5 feet by 7 feet, or 35 square feet. If you just measure the tiled area (basically, where we can stand), it’s more like 3.5 feet by 5 feet, or 17.5 square feet. In other words, you don’t need a big kitchen to do what we do! We are lucky though – when we bought our place back in November 2011, the kitchen was in the process of being completely redone. As part of the buying process, we were given a budget for the kitchen and access to a designer. 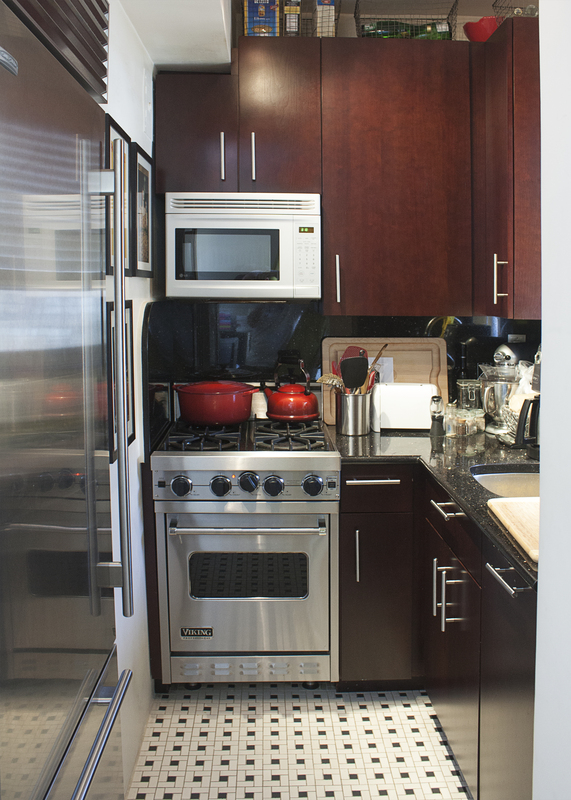 We were able to build in quite a bit of cabinet space and even got a dishwasher, which helps a lot, plus some really nice appliances. We went over budget by a bit, which added to the final purchase price. Given how much we do in our kitchen and how much joy we get from it, it was totally worth it though!